The first Arabs immigrants to come during the Great Migration were mostly men. But by the beginning of the 1900s, one-third of them were women. Many had been sent for by a male relative. However, a number of women, both married and single, traveled to the U.S. alone. Most of them knew at least a friend or a relative, who could help them upon arrival. 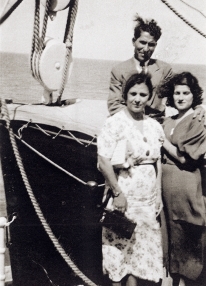 Anna Yousef Thomas and Family: There were approximately 150 Arabs on the Titanic, several survived the wreck. One of the survivors was Anna Yousef, a woman from the small Lebanese village of Tibnin. Anna was traveling on the Titanic with her two children to join her husband Darwin Toma who had been working in Dowagiac, Michigan for seven years. When the iceberg hit, Anna's door slammed her hand. Unaware that the ship would sink, she went to the infirmary to tend to her hand. After she realized what was happening, Anna quickly left the infirmary and found her two children. After receiving three life jackets, they were helped onto a lifeboat. Anna covered her children with a coat so that they would not see the horrific scene of the Titanic sinking. At dawn, their boat was rescued. Anna and her children made it to Michigan. She lived to be 91 years old. Nora Roum: Many women traveled in extremely difficult situations. Nora Roum arrived at Ellis Island from Syria seven months pregnant and was detained for observation because of an eye condition. She didn’t like the hospital’s food and an uncle brought her some Arabic food – cheese, olives, and pita bread. Nora placed them in a cabinet beside her bed. During the night, she became hungry and opened the cabinet only to find a rat feasting on her food. Nora screamed in fright and soon went into labor. Her baby was named Elsie, for the island on which she was born.